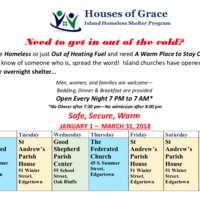 If you are homeless or just out of heating fuel and need a warm place to stay overnight or if you know of someone who is, spread the word. Island churches have opened their doors for overnight shelter. Men, women and families are welcome. Bedding, dinner and breakfast provided.